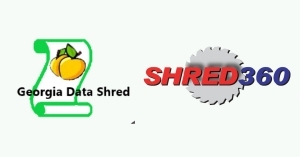 Columbia, SC – February 1, 2019 – Two of the southeast’s foremost shredding companies, Shred360 and Georgia Data Shred have announced they will merge operations under the Shred360 brand. The merger was completed on January 1st, 2019 and will create the largest, locally owned, certified information destruction company in the Southeast. Shred360 is AAA-Certified for on-site and off-site destruction of both print paper media and hard drives, and exceeds rigorous standards established by the NAID Quality Certification Program. For over 12 years, Shred360 has provided secure and high-tech methods for destruction, record storage solutions, scanning services and e-waste recycling. The merged headquarters will be located at Shred360’s current secure facility in Columbia, SC.